Professor Hermann Aicher, perhaps the foremost Austrian Puppeteer, watched his father, Professor Anton Aicher, create and perform elaborate puppet shows from the early age of ten. The Aicher family became infamous for their productions, even though they were modestly performed in their home. The family eventually created the Aicher Family Theatre in 1913. Hermann Aicher took up the puppetry tradition created by his father and headed their theater. His wife and daughters all pitched in to sustain a troupe that delighted adults and children alike, with their repertoire of over 150 operas, play and fairy tales. 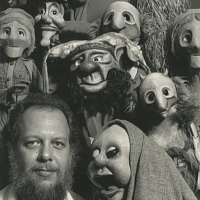 The creation of these puppets involved the whole family; while the girls created the costumes, Hermann molded the bodies, and various artistic talents of the region were enlisted to create the faces so that each puppet would have a distinct image and personality all it’s own. Aicher believed the marionette is an abstraction of the living actor. The puppet, being ideal rather than flesh and blood, provides the marionette with an increased power of illusion. The precise and delicate control system above the marionette combines genius and decades of experience: it is the head, heart and soul of the marionette. The creative will of the manipulator flows through these controls, into the puppet, and brings forth life. This group is best known for their involvement with the Salzburg Music Festival and for the innovation of over sized puppets. 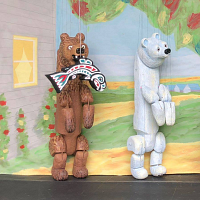 These puppets were used for large stages and audiences allowing puppetry to be more widely appreciated. His over sized puppets were approximately three and a half feet high. 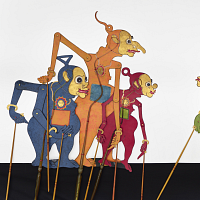 The family obtained its own theater in 1951 (now the Salzburg Marionette Theatre) providing these puppets with a permanent home in Salzburg, where Hermann Aicher continued to direct. After Hermann Aicher’s death in 1977, his daughter Gretl Aicher took over the artistic direction and maintained the theatre in keeping with the intentions of her grandfather. Some of the troupe’s listed shows were, Snow White and the Seven Dwarfs, Rumpelstiltskin, and The Wizard of Oz, for the children, as well as The Nutcracker Suite, The Blue Danube, Don Juan, and The Dying Swan for adults. 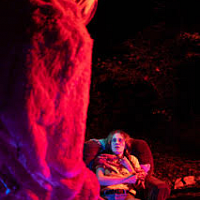 However, the troupe’s specialty focused on the works of Wolfgang Amadeus Mozart; Eine Kleine Nachtmusik, The Abduction from the Seraglio, and The Magic Flute. In addition to his published works, the troupe interpreted various episodes of Mozart’s life, most notably his audience with the Empress, and show called Wolfgang Amadeus Mozart, The Wonder Child. This modest band of traditional players has been seen all over the world, making enough trips to have gone around the world three times. Seen in Great Britain, France, Switzerland, Germany, Holland, Italy, Turkey, Scandinavia, they were even brought to Carnegie Hall, and have played over 2600 performances in over 600 towns to over 2,000,000 people.